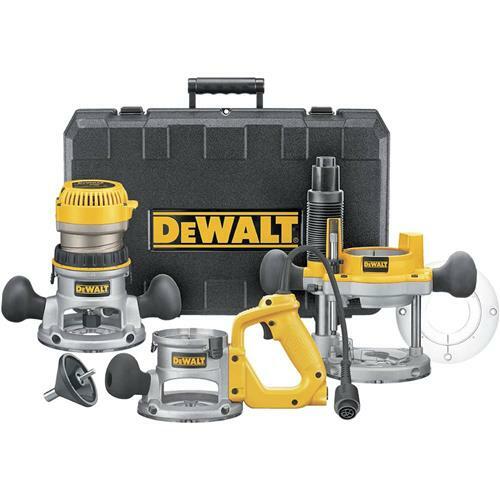 Featuring a 12.0 Amp motor that delivers variable speed performance from 8,000 to 24,000 RPM, the DeWalt DW618B3 2-1/4 HP router with a fixed base, a plunge base and a D-handle base offers all the power and versatility that professionals demand. Soft start provides an extra-smooth finish and helps ensure that this tool even performs well when working with the toughest hardwoods. With a micro-fine depth adjustment ring, you can count on accurate adjustment in 1/64-inch increments, while a clear, Lexan sub-base ensures durability and visibility. The included sub-base concentricity gauge enhances accuracy even further by helping you maintain bit concentricity, and long, eight-slot collets that are self-releasing provide excellent bit retention for dependability. The "through the column" dust collection also keeps your project clear as it collects 95% of the dust and provides superior bit visibility. A steel motor cam lock and quick-release motor latches make adjustments and base changes tool-free, fast and easy when you need to switch tasks, and a unique, detachable cordset helps keep this tool easy to service. This router also provides over-molded, rubber handles and a well-balanced body for increased operator comfort and control. The unique switch and cordset configuration allows you to keep the switch in your right or left hand, while a flat top and spindle lock further increase the ease of bit and depth changes. The switch is also dust-sealed for durability. Kit includes motor pack, DW6184 fixed base, DW6182 plunge base, DW6183 D-handle base, large-hole sub-base, 1/4-inch and 1/2-inch collets, wrench, sub-base concentricity gauge, vacuum adaptor, and heavy-duty kit box for easy transport and storage. Includes: motor pack, fixed base, plunge base, D-handle base, 1/2" and 1/4" collets, wrench, sub-base concentricity gauge, large hole sub-base, vacuum adaptor, and heavy-duty kit box. This has got to be the best router I have ever owned. I have never used a plunge router until now. The only thing I don't like about it is where the on and off switch is.